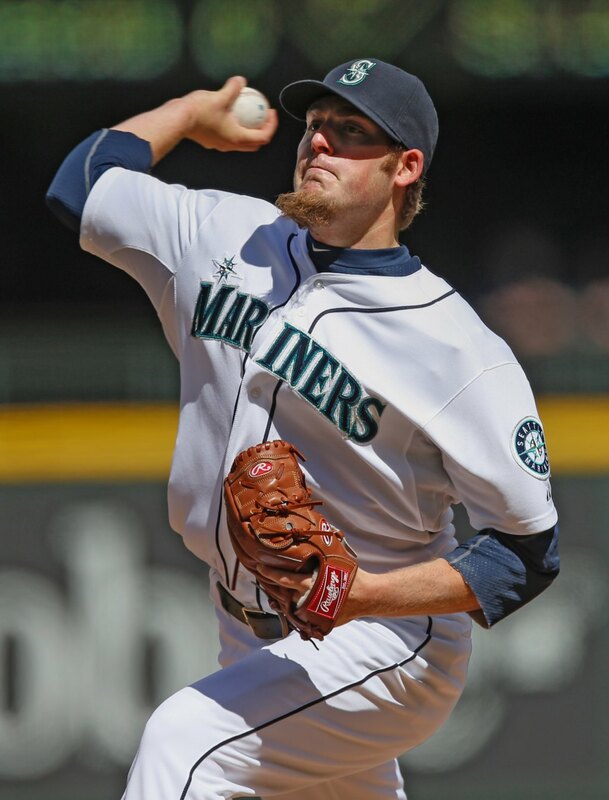 On Tuesday April 9th, Brandon Maurer started against the Houston Astros and lasted 2/3 of an inning while giving up 6 runs. On Sunday April 13th, Brandon Maurer starting against the Texas Rangers and lasted 6 innings, giving up 3 runs (2 earned) with 5 strikeouts. While Maurer has made a total of 3 whole big league starts, we'll compare the Houston and Texas games to see why he struggled against a mediocre offensive team and held his own against a much better offensive team. 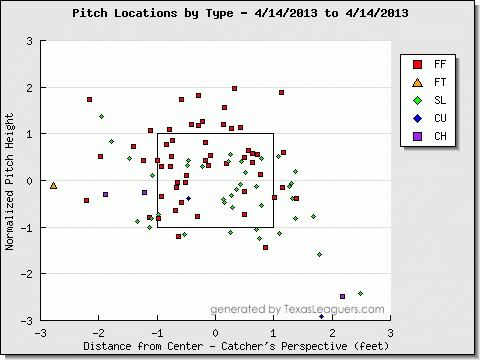 I'm going to use the Pitch F/X data from texasleaguers.com and extrapolating from the info on that site. When "the belt" is used in reference to the strike zone, I'll be using the "0" in the graphs as the belt. 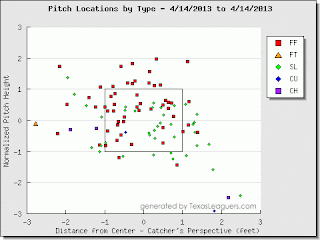 In Maurer's start against Houston, he left a couple of pitches up in the zone, which got drilled. And by a couple, I mean quite a few. 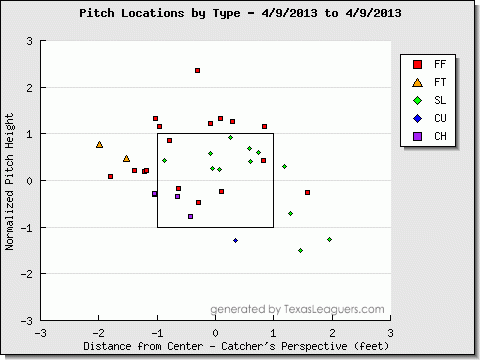 Out of the 36 pitches thrown, 12 were below the belt with 5 inside the strike zone. Out of the 24 up in the zone, 10 were in the strike zone. That's 33% below the belt with 42% of those in the zone. 67% above the belt with 42% inside the zone. In Maurer's start against Texas, he threw 97 pitches total. Out of those 97, 47 were below the belt with 21 in or on the edge of the strike zone. 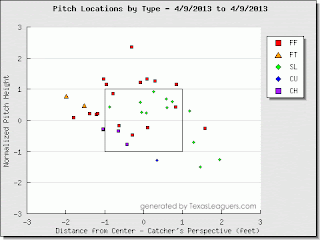 The 50 pitches up in the zone found the strike zone 26 times over the course of his outing. That breaks down to 49% below the belt with 45% of those in the zone and 52% above the belt with 52% in the zone. I realize that 49 plus 52 equals 101, but I didn't want to start putting 3 or 4 decimal places in, so I rounded up. I am also aware that there's a big difference between 36 pitches and 97 pitches, but keep in mind that there's a reason he only threw 36 pitches against Houston. Getting lit up tends to shorten a player's start quite a bit. The percentages aren't where you'd like them either, but the improvement is evident over the last two starts. It's not entirely Maurer being up in the zone, obviously. There were times when he left a two strike pitch right down the middle of the plate and it got drilled for a hit. It's also minimizing those types of mistakes. He's still a young pitcher who hasn't pitched above Double-A figuring it out as he goes along. Using FanGraphs to get a little closer look, he's given up 20 ground balls, 19 fly balls and 8 line drives. The GB/FB rate is actually pretty decent. He's getting more ground balls than fly balls, but the line drives are a little high. Hitters are making good contact against him, but you don't need to look at the numbers for that. It's something I wanted to point out, but it's far too early into the season to look too deeply into those types of numbers. For the most part, Maurer is just a young guy figuring out how to pitch against major league hitters. There will be growing pains as we've already witnessed, but we saw in the Texas game flashes of what he could be sooner rather than later. If he can start harnessing his pitches and getting them down in the zone with more regularity, he may end up being a solid starter for this season and become a #2 or #3 starter in the next couple of years with improvement. Here's hoping he's up for the challenge. Without further ado, the charts.